Why aren't there wars of conquest anymore? 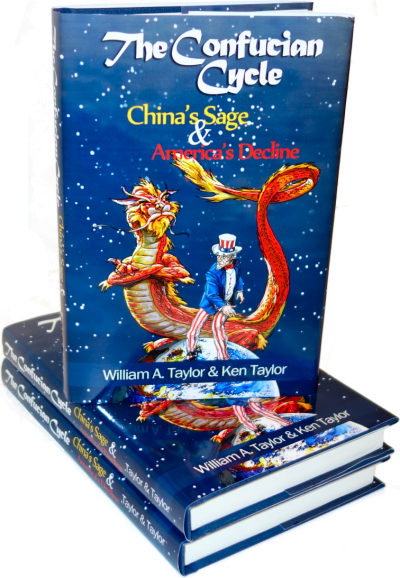 In the normal working of the Confucian cycle which Scragged has explored at great length, government always gets more and more expensive and more and more wasteful to the point that society can't operate anymore and collapses. In the Chinese situation, the Mongols would sweep in from the north, throw the rascals out, and start a new dynasty. This was a bit rough on the ruling elites, of course, but the vast bulk of the citizens benefited from having the bureaucracy reset back to zero. In our modern world, however, there seems to be a shortage of Mongol Hordes who're ready to take over failed states and put them right. When the collapse comes, what if there is no conquering hero available? 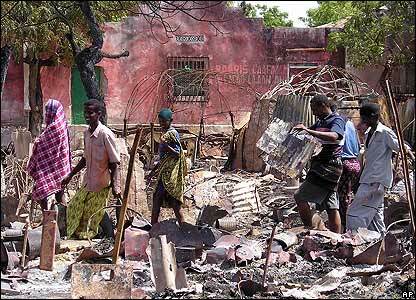 We know what happens - we get Somalia. Somalia-like anarchy happened in China as well from time to time. When the government collapsed at times when the Mongols were too weak to invade, anarchy reigned until someone managed to battle his way to the top of the heap and reunite the country. This process can take a long time - it took what's now Germany nearly 1,000 years to become a united nation after the Roman empire ran out of money and collapsed. Somalia hasn't had a functioning government since the early 1990s. The resulting anarchy is very bad for the Somalis and inconvenient for ships that get grabbed by pirates, but it doesn't bother the rest of the world too much. Unlike historical times when empire building was the norm, nobody wants to invade Somalia because it simply isn't worth the cost of taking it over. This is an important consideration even though it's seldom stated explicitly. A nation can afford to do only so much. If a government spends more than it receives in taxes, fees, and other sources of income, it can live on loans for a while but eventually collapses. Conquering another country can relieve the situation, but only if conquest shows a profit. If enough natives are willing and able to shoot back, conquest isn't profitable and sensible nations stay out of the situation. What you get when you have no government at all. In Somalia, local ganglords can control their own territory, barely, but aren't strong enough to unite the country. Thanks to the existence of importable modern technology, simple low-cost weapons such as AK-47's and rocket-propelled grenades have become cheap enough that anybody who wants to can shoot back. Guns have been called "the great equalizer;" it's difficult to pacify an armed populace, and modern guns are so cheap that even residents of the poorest countries can afford as many as they need. Somalia has more than enough weapons to prevent a single unified authority from arising. The film Black Hawk Down dramatized the American military's 1993 failure to capture a Somali warlord, something that you'd think would be fairly small potatoes for the World's Sole Superpower. The Somalis shot down two Black Hawk helicopters, either one of which cost more than Somalia's entire national economy, demonstrating that they're well enough armed to deter any outside force from trying to take over at a price anyone is willing to pay. The country can't be united either from within or from without, so anarchy continues indefinitely. A heavily armed and thoroughly un-unified populace makes it hard to combine warring tribes into one nation; we're finding this out the hard way in Afghanistan. This is why most sensible tyrants disarm their citizens at the first opportunity. Most Afghans have access to pretty much the same technology as the Somalis - AK-47s, grenade launchers, perhaps the occasional Stinger missile or used Russian tracked vehicle, and they're getting pretty good at improvising Weapons of Roadside Destruction. American troops are vastly better equipped, but again, at a cost that dwarfs the entire economy of the place. Even if America's goal was to take over and run the opium fields for our own profit - which it certainly is not - it would be a long, long time before we'd ever make back our investment. The Soviets discovered the same problem decades ago; although the cost of matching Reagan's Star Wars played a part, their ill-fated invasion of Afghanistan is often credited with destroying their economy and collapsing their empire. America isn't the only great power whose travails illustrate this problem. Fifty years ago, China invaded Tibet, and has ruled with an iron fist ever since. This hasn't made a bit of difference; despite massive investment in infrastructure, policing, regular military intervention, and the occasional massacre, Tibetan insurgency continues. Will it ever end? It's hard to see how, unless the Chinese simply execute all the Tibetans and have done with it as the Romans would have done. Failing that "final solution," the Chinese are having enough trouble pacifying Tibet that it's possible they wish they'd never invaded in the first place; it certainly hasn't done them one whit of good politically, diplomatically, economically, militarily, or diplomatically. Fail On, Fail On, Fail On and On! What does the absence of outside conquerors mean for failed states today? In the past, if the Greeks let their government get too weak, they'd be invaded by the adjacent Ottoman Turks. At this point in history, the Turks are rather too busy with internal politics to go conquering, and even if they could organize the effort, empire-building doesn't pay any more and they'd go broke. Without an external conqueror, a failed state falls apart into anarchy. Each local warlord controls his turf but, so long as other countries continue to have enough industrial capacity to manufacture cheap weapons, it won't be possible to reunite the country. One of the stranger aspects of modern life is just how easily Westerners have become used to a world in which most people understand very little about how anything they use every day actually works. One hundred years ago, every farmer knew exactly how a plow, wagon, and horse came to be and were maintained; in a pinch, he could fix most common problems himself including simple doctoring and dentistry. Given some rudimentary supplies, pioneer families were perfectly capable of operating entirely on their own for months on end. They usually needed help when the woman was about to have a baby, but were mostly self-sufficient the rest of the time. How many people know where their electricity comes from and how to generate more if need be? How many people understand the inner workings of their car, to say nothing of a computer? Modern Americans are lucky if they thoroughly understand one single technology out of the hundreds in daily use. What is "the Clapper" to most people but incomprehensible magic? Nothing could be further from the truth: technology is not magic. The magicians of legend could work miracles with a few vials of weird ingredients and a magic wand. Modern technology may seem magical to the uninformed, but that's only because the massive supporting infrastructure that makes it work isn't immediately visible. The complexity of modern technology has made us a world of interconnected experts. We don't worry about our electricity because we know there is a powerplant somewhere, designed and built by expert engineers trained in that art, operated by more engineers educated to do that, the power brought to us via lines installed by still other workers who know how to climb poles, and then distributed through wires installed in our house by a knowledgeable electrician. Without additional training, none of these jobs is interchangeable; a home electrician can't run a powerplant much less build one, nor could he climb the poles to maintain the wires in the distribution system. The only reason it's possible to operate such a complex society is because government enforces the peaceful exchange of commerce. The power company can count on being paid for providing power and can confidently offer their engineers regular salaries. The coal mine knows it can readily sell coal to the power plant and that the railroad will reliably transport it there. Young adults have such long-term confidence in the smooth functioning of society that they are willing to invest years of their lives in college or trade school qualifying for a responsible job. Who would bother to train as an electrician if they didn't have confidence that there would be electricity available when they were done? We at Scragged believe that smaller government is urgently needed, but we're every bit as opposed to anarchist-libertarians as we are to fascistic statists; you have to have some degree of reliable, predictable, orderly, organized government for a halfway comfortable life to be possible for most people. Destroy commerce, the modern world stops, and we revert to muscle-powered agriculture to avoid starvation. A foreign invasion has the same effect: tanks and bombs destroy the infrastructure necessary to put together the various parts of an economy and kill many of the people needed to make it go. Even though their highly-educated population was still mostly in place, it took the Japanese and Germans 30 years to rebuild after the destruction of WWII. There is another way to destroy technical civilization: oppressively incompetent government. The modern history of Africa provides scary examples of nations which at independence had generally-functioning modern economies, and thanks to kleptocratic misrule no longer do. When Zimbabwe became a racially-open democracy in 1980, it had modern cities, roads, railroads, airports, seaports, industries, factories, sewers - all the equipment of modern industrial life. These assets weren't evenly distributed and many native Africans still lived in poverty, but the foundation was there to allow the whole nation to grow into wealth. Instead of building on what he inherited from the British, President Robert Mugabe decided to steal and destroy all of this accumulated wealth. Productive farms owned by whites were invaded by uneducated peasants and politically-connected politicians who had no idea how to run a modern farm. At best, those rich farmlands are reduced to subsistence-level and grow a tenth of what they once produced; most simply lie fallow. The same thing happened to factories, industries, and transport links. Where once Zimbabwe exported food around the world, now it stands on the brink of starvation. A strong economy has been destroyed by hyperinflation. There are no reliable courts to enforce contracts or property rights; there are no longer "free and fair" elections with the results respected. President Mugabe is king of a swamp. The nation of Zimbabwe is ripe for conquest by a more competently-run state; half the Zimbabweans would probably welcome anyone who'd rid them of their incompetent and evil rulers. It isn't going to happen, however, because the neighboring countries are no better run and the great powers couldn't possibly make it pay. Thus, Zimbabwe stumbles along the path blazed by Somalia. Mugabe destroyed Zimbabwe by confiscating the wealth of the productive and giving it to the his followers who didn't know how to make productive use of it. Western governments are doing the same - more peacefully and more slowly, of course, but every bit as surely. With a president who believes there's a maximum amount people should be allowed to earn, surrounded by officials who believe the have-nots have the right to take from the haves, what's the difference? It used to be that over-sclerotic or incompetent governments got reset by outside conquest. This doesn't happen anymore since countries aren't supposed to invade each other and invasion wouldn't pay even if they did. Instead, you get failed states like Somalia which would be far better off if someone decided to care enough to invade and take over; bankrupt states like Greece that can't get their act together yet there's no force making them do so; and general sclerosis. It's a little like the modern problem of survival-of-the-fittest being suspended due to welfare payments and free health care. Instead of conquest, what can you do with a failed state? We'll explore this question in the next article in this series. The Clapper - Clap On! Clap Off! American "sclerosis" may also have something to do with the citizen voters who make it a point to vote for whichever of the two parties is currently in the minority power-wise. The idea is to keep the two parties at each others' throats and unable to effect any real change, which these voters view as being probably negative regardless of which party were in power. What percentage of "swing voters" vote with this rationality? I don't know, but I do know that they exist. In effect, they promote slow, gradual changes of the sort that both parties can agree to; these can be positive or negative. "You can't ignore the pirates anymore. They're getting more and more muscle. They used to invest their money in just boats and going out to sea but now they're building up their military side." - MOHAMED ADEN, a clan leader in central Somalia. Another one! Must be getting serious. can the pirates afford to conquer Somalia? After years of not getting sucked into the messy civil war on land, Somalia's pirate gangs are taking sides - both sides.